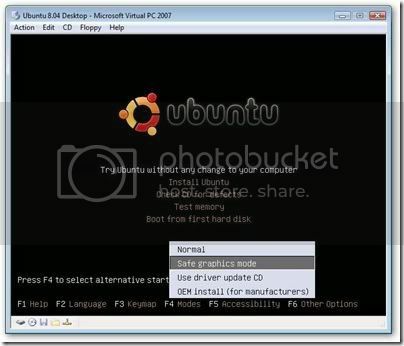 How to install ubuntu 8.04 LTS desktop edition on Virtual PC 2007? The following is a step by step tutorial. 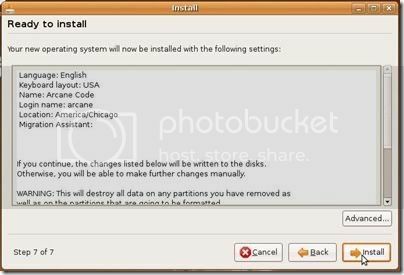 How to install ubuntu 8.04 on Microsoft Virtual PC 2007? The first screen to come up, asks for the language. Select your language, and press Enter to continue. It will take some time (around 10 minutes) to move the next screen and don’t panic.Once ubuntu boots, you should see the live session trial environment. You will see a welcome screen, where you can also change your language, if you want to have ubuntu installed in a different language than you already chose earlier. Press Forward to continue. It will take time (around 6- 8 minutes) for the disks to be prepared and proceed to the next screen. you will find Step 6 missing, but don’t worry. Just click Install to begin the install process. If the restart does not happen on its own, then in the Virtual PC menu click Action –> Reset. Shut down the Virtual PC 2007 session while saving the state. Start the Virtual PC 2007 session again and it will boot fine.The boot process does take a few minutes. Once it gets to GRUB, interrupt the boot and add the “noreplace-paravirt” to the kernel boot line. How to permanently add “noreplace-paravirt” option to grub? In System, Preferences, Sound, set the playback options to ALSA. It’s pretty crappy but works better than OSS and certainly better than Auto detect which generates a stream error when you try to play MP3’s or movies. 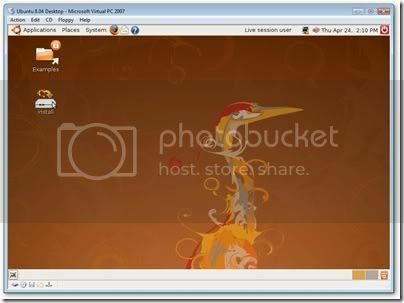 You can free download Microsoft Virtual PC 2007. You can also check out how to install ubuntu on windows with a single click and without the need for any partition. Update: You can also install ubuntu 8.10 on windows straight from CD, without the need to partition manually. Tutorial- Making A Virtual Machine, Linux Inside Windows. Nice tutorial, I will be installing Ubuntu on my laptop soon. after doing safe graphical when I start to load ubuntu 8.04 it says “An unrecoverable processor error has been encountered. what is the problem here and whats the solution?? ?plz help me out…. Now choose “Try Ubuntu..” and press enter. Great Instruction. It was my day saver. Thank you. When I try and hit return to “Try Ubuntu without any change …” nothing happens. I have tried all the other options and they do not work. However if I do hit F2 and change language, by using return, this works. Great tutorial.. I used it with version 8.10 and it worked! Used this with 9.04 and it worked great. Worked with me on Ubuntu 9.04 Flawlessly! And, The install didn’t take more than 20 Mins. Max.